Sunday Dress + Every Day Carry + South-western Artistry = Stoneworx. Description: I'm very pleased with the Stoneworx Canoe. Both blades have better snap than that found on my White Smooth Bone Canoe. There is also very little blade rub for a canoe. No doubt the main draw of the Stoneworx knives is their handle material. According to the box, the handles are made of natural material. This box is not 100% clear on what that means. To clarify, The handles are made with genuine pearl and abalone. The other stones are synthetic; which is not necessarily a bad thing. Synth-stones are laboratory made stones which are chemically identical to natural stones. Typically synth-stone is made from waste stone which is ground up and then through pressure or heat treating reformed into useable stone. Synth-stones has fewer impurities and imperfections than natural stone making it more stable to use and less expensive than natural stone. For this reason alone it is being used more frequently in the Jewelry industry. 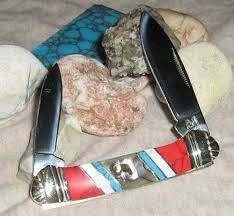 The blue stone in the handle is synthetic turquoise, the red and yellow stones are synthetic jasper.